There was plenty of good early pressure from Thatto Heath and follwing two penalties awarded in quick succession, Lewis Foster went over the line backwards under the tackle after scooting from acting half back, tackle and twisted to ground the ball. Bobbie Goulding kicked the conversion for a 6-0 lead. The North Wales Crusaders then peppered the Thatto Heath line but the home defence held firm, denying the visitors. It was Thatto Heath who extended their lead when a walkover try from Connor Dwyer saw him get the ball to ground despite being wrapped up in a tackle over the line. Goulding was unable to convert. Just after the half hour the visitors registered their first points as Rob Massam pushed through three tacklers to get the ball to the ground for a four pointer. Kenny Baker pulled his kick wide of the left posts to leave his side still trailing by six points. After a long stoppage for a neck injury to Karl Ashall both sides had opportunities to score but the sides went into the interval with the home side with a 10-4 advantage. 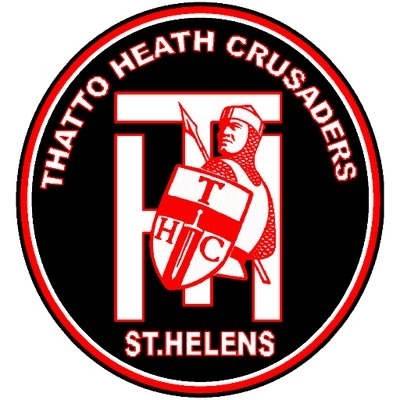 Great Thatto Heath defence thwarted an early Earl Hurst attack, pushing the NW Crusaders centre into touch. An Adam Prendergast one-on-one steal resulted in a penalty to Thatto Heath with Bobbie Goulding dropping his attempted penalty goal just short. Matty Norton scored a freak try for the home side after a NW Crusaders kick was charged down and knocked backwards for Norton to pick up and go forty metres to score under the sticks. Goulding kicked the conversion for 16-4. The visitors spilled the ball in the act of scoring on fifty-seven and on sixty-seven Simon Atherton was held up over the line. Two plays later Chris Worrall finally found a gap and went over for the second NW Crusaders try of the afternoon. Ben Stead kicked a terrific touchline conversion to trail by six poins with eleven minutes remaining. With five remaining Ryan Smith was taken out as he chased his own grubber kick through and on the next set they were held up over the line on the last tackle. Two minutes remainded when Massam scored his second of the game as he found his way over on the overlap after the NW Crusaders kept the ball alive. Stead pulled his conversion attempt in front of the uprights and the visitors still trailed by two points. Despite NW Crusaders pressure at the death the home side held on to make Round Five of the Coral Challenge Cup for the first time in their history. There was very little to choose between these two sides who are separated by just a small number of places on the league ladder. Thatto Heath matched their loftier visitors blow for blow and despite lacking a little in skill they made up for it in enthusiasm to hold on at the end and grab the win. Thatto Heath: Heyes, Saunders, Lee, Norton (T), Allen, Crehan, Goulding (2G), Stark, Foster (T), Lea, Prendergast, Dwyer (T), Tracey, Bradshaw. Subs: Bradshaw, Hesketh, Dudley, Ashurst. North Wales: Price, Conroy, Atherton, Hurst, Massam (2T), Roper, Smith, Hazzard, Ashall, Thompson, Houghton, Worrall (T), Baker. Subs: Stead (G), Brennan, Eckley, Walker.